Leading the pack in this momentous transition are Nordic nations such as Norway, whose parliament this month voted to become carbon neutral by 2030. “This is a direct response to the commitments Norway took on by ratifying the Paris Agreement and means that we will have to step up our climate action dramatically,” Rasmus Hansson, leader of the Norwegian Green party in Parliament, told the Guardian after the vote. The Nordic countries were among the first nations to price carbon, with Finland, Norway, Sweden, and Denmark all adopting carbon taxes in the early 1990s. By dint of geography and policy, these countries are clean energy front-runners. Hydropower supplies 95% of Norway’s electricity. 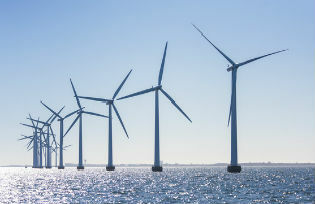 Wind turbines supplied 42% of Denmark’s electricity in 2015. Norway has already nearly decarbonised its power supply but it will be much harder to cut carbon emissions in other sectors. Owing to generous tax, toll, and parking incentives, Norway is a world leader in the deployment of electric vehicles. EVs (including both plug-in hybrid and all-electric models) comprised 29% of new car sales in May 2016. Officials in Oslo, Norway’s capital and most populous city, are also working to persuade residents to opt for means other than cars to get around. On June 23, the City Council voted to ban cars from the city centre by 2019 and approved a plan to slash greenhouse gas emissions by 95% from 1990 levels by 2030. “A key part of the plan is to prioritise pedestrians, bicyclists, and public transport before car traffic, both when it comes to investments in infrastructure and the use of space,” Lan Marie Nguyen Berg, Oslo’s vice mayor for the environment, told Climate Home. Denmark is pursuing an even more aggressive path. In my new e-book, “Quitting Carbon: How Denmark Is Leading the Clean Energy Transition and Winning the Race to the Low-Carbon Future,” I describe how beginning in the mid-1970s Denmark’s power and heating sectors shifted first from oil to coal and, later, from coal to energy efficiency and clean energy supplied by biomass, the sun, and wind. Under an energy agreement approved by Parliament in March 2012, all sectors – electricity, heating, industry, and transportation – are to be fossil fuel-free by 2050. A plan approved by the Danish Government in August 2013 added medium-term targets. It prohibited the use of oil for heating and all uses of coal by 2030, and stated that the electricity and heating sectors will be 100% renewable by 2035. Unlike Norway, Denmark does not have a plentiful and cheap supply of domestic hydropower. The country is, however, making every effort to harness its abundant wind resources. The March 2012 energy agreement calls for 50% of Denmark’s electricity to be supplied by wind turbines by 2020. In practice, this means Denmark is working to electrify every segment of the economy – from the power sector to heating to private automobiles. The predominantly state-owned utility DONG Energy recently invested US$10.3 million to install Denmark’s largest electric boiler, which will convert cheap surplus wind electricity into carbon-free heat for the district heating system in Aarhus, Denmark’s second city. In rural areas where homes are not connected to one of Denmark’s district heating networks, oil-burning furnaces are being replaced with electric heat pumps. In time, the battery packs in thousands of electric vehicles will charge with surplus wind power at night. Denmark’s decades-long clean energy transition is delivering results. The country’s adjusted gross energy consumption is essentially unchanged from the early 1970s. By the end of 2014, renewable energy sources accounted for more than 53% of Denmark’s domestic electricity supply. The country’s CO2 emissions have declined by 27.4% since 1990. While Denmark has focused on domestic actions to reduce its emissions, Norway’s just-announced 2030 target relies on EU and international carbon offsets. A looming challenge is the carbon footprint of country’s oil and gas sector. The 2030 plan does not compel Norway’s lucrative oil and gas industry to make domestic emissions cuts. Legacy fossil fuel assets are also problematic for Norway’s neighbor, Sweden. On July 2, Sweden’s centre-left government approved the sale of the German lignite (brown coal) assets held by state-owned utility Vattenfall to Czech utility EPH. Climate campaigners, including Al Gore, had implored the government to explore ways to keep the coal in the ground. Instead, Sweden will spend 300 million SEK (US$35.6 million / 308.8 million yuan) annually from 2018-2040 to buy and cancel allowances from the EU’s emissions trading system. Both examples reinforce how difficult it will be to achieve the climate targets enshrined in the Paris Agreement. After all, when exported Norwegian oil is consumed in the US or India, for example, the resulting carbon emissions don’t besmirch Norway’s carbon totals. Likewise, the carbon emitted by Vattenfall’s lignite-fired power plants in Germany, accrues to Germany’s carbon ledger, not to Sweden’s. Electrification, biofuels, and energy efficiency solutions – deployed in the Nordic nations and beyond – must succeed in driving down demand for fossil fuels everywhere. In the end, when counting carbon, the only numbers that matter are global.